Isabel is the latest in Tocca's collection of feminine-named fragrances, and its scent-personality is described this way: "A chic city girl from Barcelona, Isabel is an unconventional yet remarkable beauty. Like her hometown, she is eclectic, unpredictable and captivating." Isabel includes top notes of bergamot, Mediterranean orange, pear and sangria accord; middle notes of Spanish rose, leather, vetiver and Turkish rose petals; and base notes of guaiacwood, amber and vanilla. I've tried a fair number of Tocca's perfumes, and they tend to fall into two categories for me: ones that I like and then can't remember much about later, and ones that are complete scrubbers for me (ahem, Florence). Isabel will be an easy one for me to recall — as my friend D. said when she sniffed it on a paper blotter, "It's basically tea rose, isn't it?" Well, yes. Sniffed directly from the vial, it reminded me of Stella by Stella McCartney. But once applied, it's a lot of dewy tea rose, without the powdery aspect of some older tea rose perfumes, and it has a surprisingly amount of sillage for something so pastel and transparent. The promised Mediterranean notes of citrus fruits and leather and sangria never make an appearance, which is too bad (especially if you were looking forward to the sangria, as I was). But the rose lasts for hours, gradually allowing minor notes of pear, lily and a very sheer musk to emerge. Isobel is anything but "unconventional" — unless, perhaps, you're too young to remember Stella or any of the "rose" flankers of the past decade. Three years ago (! ), I wrote about the appeal of Tocca's fragrances, "They're generally light, feminine scents with sweet floral and fruit notes, they're packaged in antique-looking bottles, and they have names that refer to romantic locales or famous women in history. Tocca isn't a niche line, but it offers a semi-mainstream alternative to celebrity fragrances, teen-oriented scents and logo-encrusted 'aspirational' products." That sentiment applies to Isabel as well as the brand's earlier scents. 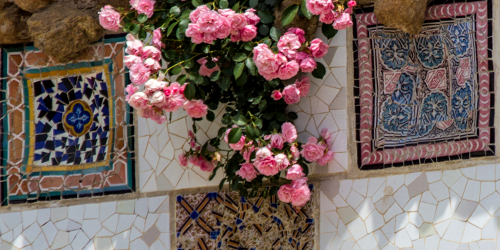 Isabel is certainly not "unconventional," "eclectic," or "unpredictable" — however, it's a very pretty tea rose composition and it would make a perfect introductory rose fragrance. I'm putting it on a mental shelf with other fresh, approachable roses like Diptyque Eau Rose and L'Occitane Roses et Reines for future recommendations to rose novices. Do you have a favorite Tocca scent? Feel free to comment! 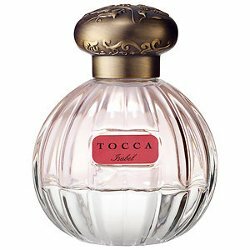 Tocca Isabel is available as 50 ml Eau de Parfum ($68). For purchasing information, see the listing for Tocca under Perfume Houses. Note: top image is Trencadís [cropped] by Andrew Moore at flickr; some rights reserved. Hmm, my step-sister might like this one–thank you for the review. My sister wears the Lutens-lite one (gin, amber, fruit, and pencil shavings, but with the volume turned to medium low), though I can’t remember the name of it. It is one of those scents like Bobbi Brown Beach, Infusion d’Iris or Daisy that I don’t flip over, but I am perfectly happy smelling next to me in the elevator or the train. I know just what you mean, and I feel the same way about those three fragrances — I’d definitely recommend them to others, although they don’t *quite* make my heart sing when I wear them myself. I really want to love a Tocca scent because the bottles are just so great; their heft, shape and nice quality make me want one. Alas, I have only liked Cleopatra, which is the somewhat tuberose inspired one. I bought Cleopatra back in ’07 or so but now that I have a half dozen much better tuberose-y scents I would never buy it again. I think I did like Touch — it was more potent, and a bit strange! And yet there is a nice tuberose one – Cleopatra, or is it Florence? I quite liked it until I forgot about it. That’s the thing with Tocca fragrances. Nothing much distinguishes one from the next, and in the end they all slip out of the memory. Jo Malone – a similar line in some ways – solves that problem by naming the fragrances after the notes. The English are maybe more practical about this kind of thing! I have Cleopatra – it has a cucumber note I adore. I admit I never wear it, and never fell in love with any of the other Toccas either. (I have a Florence mini somewhere but can’t find it.) It is tough to keep the names straight! The pretty bottles must be why they sell them in Anthropologie, but I was always disappointed to actually smell them – the clothing and decor in Anthro is always interesting, and the Toccas feel mundane to me by comparison. They really are lovely little bottles! and the fit Anthro’s environment so well. I”m often tempted by little dresses and candles and cosmetics and what-not in that store. I couldn’t pick a single Tocca fragrance out of a police lineup, so to speak. hah! Violette is pretty, although not very distinctive. But you’re right — they’re not exactly avant-garde creations. I’m fond of Bianca for summer, a tea and rose-flavored lemonade. I own two of the mini sizes, and the bottles are adorable! Well, that does sound very nice, and I don’t think I’ve tried it yet! I’ll make a mental note for my next Sephora trip. That sounds exactly like the sort of thing I like for summer. I think this line is perfect for the office. Pleasant and not much sillage make for happy co-workers! I agree — and since many of us do spend some time in offices, for one reason of another, it’s a good thing that such lines exist! Cleopatra is still one of my favorite Tocca scents in all its various forms. The candle is so relaxing, and I love the laundry wash though you need to use a lot to get the scent to “stick.” It reminds me a bit of a more affordable alternative to the original Narciso Rodriguez for Her, with way more products from which to choose. I’ve been tempted by Liliana, Margot, Violetta and a few others, but haven’t found anywhere locally to smell them. One of these days I’ll spring for the Meet the Girls set and do a bit more exploring. They seem like they’d be perfect for summer. Oh and agreed, Jessica. A rose and sangria perfume would be spectacular, especially for the upcoming autumn here. I have lots of spicy roses and a couple fruity ones, but nothing that would fit that description. Tocca *is* very smart to offer smaller sizes and sets!! and yes, I’d love a sangria-with-rose scent. Maybe Serge’s Fille de Berlin reminds me of sangria a bit…or something from Rosine? One of my good friends wears a Tocca fragrance; I think it is called Collette. It smells so clean and pretty on her. I always wanted to try the line, just never had a chance to get around to it. I don’t think I would like Isabel because I really don’t care for tea rose fragrances. I’ve had a few friends and co-workers who wore various Tocca scents — I think they appeal to my demographic of 30-something women-in-museum-work and other arty types! I really enjoy the Giulietta fragrance. It is pretty, light and uncomplicated. But, if I am to be completely honest, I love the backstory Tocca has created for this one – about the love story of Federico Fellini and Giulietta Masina. I don’t care much for most of these so-called inspirations, but I adore Fellini films and I think Masina was one of our greatest actresses. That is a pretty one — and I really liked the shower gel and lotion!! Giuliette is one that I have a sample of, and I have no recollection of what it smells like, although I know it is light and pretty…like others here, I would love to like one of the Tocca scents well enough to buy a bottle, because of the cute little bottles, but I sniffed them all at the store one time, and they basically all smelled the same to me, pretty enough in a bland way but featureless. Maybe I overdosed my sniffer. I am probably going by there next week sometime, I guess I’ll try again…. I really like margaux. It is a little spicy, and nice for fall. I thought Isabel was pretty at first, but did not enjoy the dry down. I would own Margaux, but it didn’t last long enough on me. I always somehow manage to pass these at Sephora. All the pretty little bottles lined up on several shelves, overwhelming, the antithesis of the scarey-looking Montales but yielding the same reaction. When I run out of perfumes to explore, I will gladly move on to this line. ahhaha! You hit the nail on the head — I feel exactly the same way about Montale, and I’d probably like some of them!! The list of notes in this one make it sound interesting. It’s too bad that they didn’t all manifest themselves in the end. I have a Collette roller ball that’s about 9 years old. I used to like it but one day I noticed some weird ashtray smell that I hadn’t picked up before and haven’t worn it since. I do think the cute little coffrettes would make a nice gift for a young’n though. I agree — perfect gifts for a college student or 20-something who’s looking for a new scent! I need to keep those coffrets in mind. I have a bottle of Bridgette, found it on ebay a couple years ago. It’s the spicy one, the most oriental of the line. It’s nice, but i don’t love wearing it. I do have fun memories from wearing it to a party back when i bought it, but it soon got replaced by Perfume perfumes, you know? I know exactly what you mean! At a certain point in time, Isabel would have joined my collection and gone into heavy rotation, alongside Crabtree & Evelyn and Issey Miyake Eau d’Ete and others. Right now I’m just more into darker, moodier roses or all-out nostalgia powdery violet-roses. Tocca is one of those brands that I find quite adorable and romantic. I want to love it but ultimately can’t because the fragrances are pretty much just okay or complete scrubbers. I wonder how many people do enjoy Cleopatra. Tocca seems to be promoting it a lot. I personally cannot stand it at all! I do enjoy Margaux though. It’s more “classic” and interesting than the rest of the “girls” imo. Isabel sounds like a good easy rose to wear, but maybe not enough to make me put away my other easy rose L’Eau de Chloe. I actually thought of L’Eau de Chloe as I was writing this! No, if you already own that one, no need to purchase this one. Same goes for Bulgari Eau Rose-whatever, Parfums delRae Coup de Foudre, et al. My fave from Tocca was Touch…but sadly they discontinued it, so I don’t really have a fave from the line, no more. Florence is giving me a bad headache and the rest is really just basic. The bottles are cute, but I don’t really want to buy any perfume, just for the bottle itself. More than one Touch fan! I thought that one was more sophisticated, too. And I’m glad I’m not alone in my Florence aversion. I’ve always wanted a Tocca b/c the bottles are so beautiful, but I’ve never. The one I like best is Stella – it’s really just a sweet orange blossom, but there are a few minutes in the opening that have that snappy green twiggy petitgrain accord that I really like. Other than that, it’s very pleasant, but I have other very pleasant OBs. Isabel sounds nice, but I already have enough roses……….. I remember loving the Stella candle — so blood orange-y — and then being disappointed in the fragrance. Why didn’t they leave well enough alone? Isabel is nice, but I already own a few simple dewy roses, so — !